I recently heard Dr. Christine Northrup speak about Diet Sodas. She said one reason people can be hooked on them is because artificial sweeteners actually kill brain cells – and when the cell dies – it creates a chemical reaction producing a short high. This high contributes to your desire to want to drink more…a sad side effect of dying brain cells. 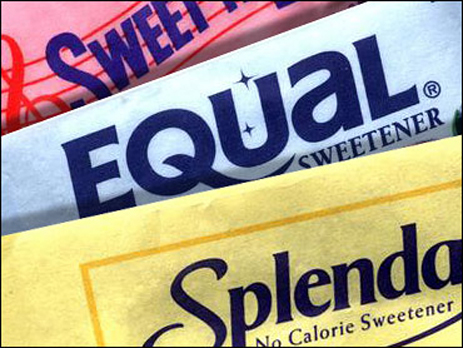 Research is pointing to two significant findings as it relates to artificial sweeteners. There is a high correlation with obesity. So much so that New York is actually looking to ban serving pop (of any kind) in cups larger than 16oz. The obesity epidemic began at the same time that artificial sweeteners entered our food supply (source). As you’ve surely experienced yourself, just the thought or smell of food initiates a set of hormonal and physiological responses that make you want to eat more and prepare your body for consuming food. With artificial sweeteners your body prepares for the caloric intake of sugar, but your body doesn’t get sugar (let alone food). But it thinks it’s coming so will “crave” calories until you fulfill that need. When researchers studied the effects of an artificial sweetener on rats they found 1. The total amount of food the rats ate dramatically increased over the next two weeks; 2. The rats gained weight & their body fat increased significantly, and 3. Their core body temperature declined indicating a slowing down of their metabolism. Diet drinks can now be re-named to Pound Packing Sodas. It can be found in baked goods, chewing gum, diet beverages, desserts, candies and even some pharmaceutical drugs! Its side effects have been well documented and include headaches, migraines, dizziness, seizures, nausea, numbness, muscle spasms, heart palpitations, vision problem and anxiety. And the following can be worsened by aspartame: diabetes, MS, chronic fatigue syndrome, fibromyalgia, Parkinson’s, birth defects and epilepsy. Significant sugar cravings are most often related to intestinal imbalances that can be remedied. But if you are just looking to sweeten up a recipe or your cereal, your best bet is whole fruit. Your body wants and needs all the vitamins, minerals and fibre that go along with eating food in its natural form. Eating fruit whole, naturally slows down sugar’s release to your blood stream, stabilizing your blood sugar significantly more than anything you find processed or manipulated with. Good options include dates, apples, pears and prunes. The next best options include organic, raw (unprocessed) maple syrup or honey. Then stevia and fruit sugars you could look here. Next agave (some detriments have been noted here). Lastly plain white sugar, which I don’t recommend for a host of reasons, but it is still better than artificial sweeteners. Avoid aspartame, acesulfame, sucralose, sugar alcohols such as malitol and xylitol (pretty much anything that ends in “ol”).